Which ceiling light should you choose for the kitchen? 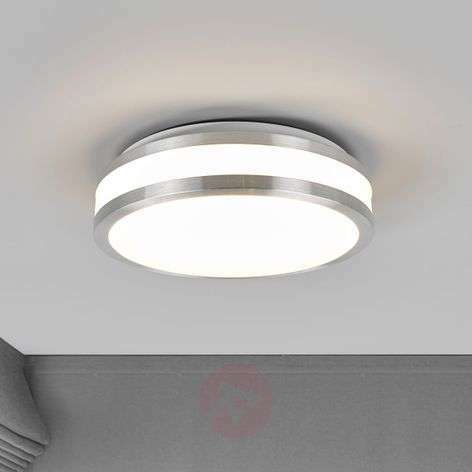 Can you get LED ceiling lights for the kitchen? 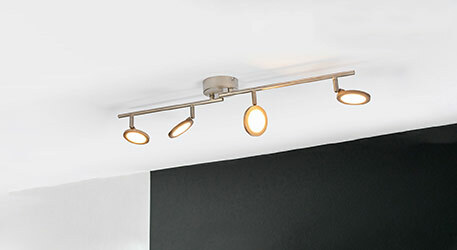 Are there modern ceiling lights for the kitchen? Can you dim kitchen ceiling lights? Can you get flat ceiling lights for the kitchen? Are you passionate about cooking? Do you love spending hours in the kitchen, just trying out new recipes? Or is the kitchen a place where you quickly heat something up before smearing it in butter? Perhaps the truth lies somewhere in between! It doesn’t matter which one of these rings most true for you: you simply need light in the kitchen, or, to be more specific, you need general lighting in the kitchen. Without it, you can see neither your delicious five-course meal nor your buttered bread, let alone the ingredients for your creations. 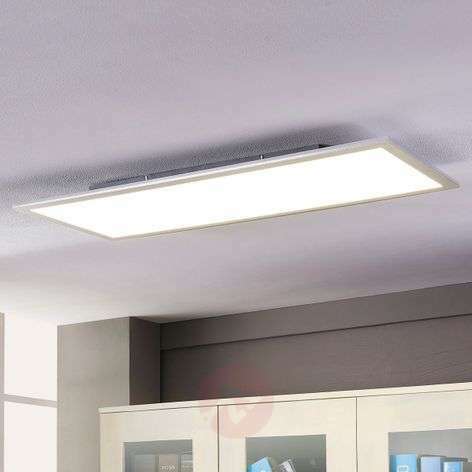 Ceiling lights provide the best light in kitchens for sufficient general lighting and it comes in a wide range of options. It really depends on your taste and a little on what your kitchen looks like. You really are spoilt for choice. 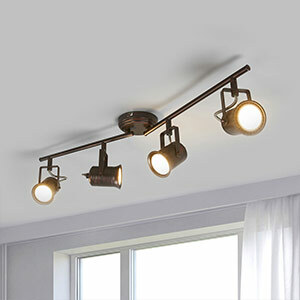 There is a wide variety of styles and variations of kitchen lights, as well as plenty of mixed designs. 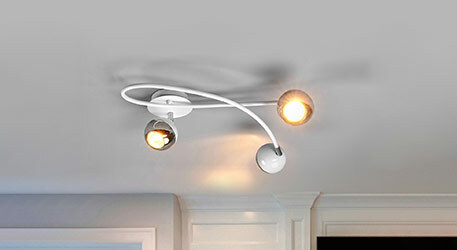 The classic among kitchen ceiling lamps. 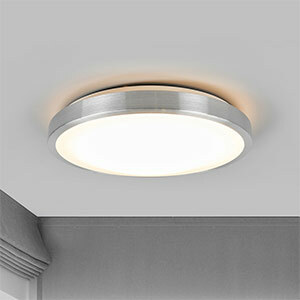 Timelessly modern or in a specific style, it will provide the best light for evenly distributed, general lighting. They generally come with more than one bulb. As such, they are extremely practical for rooms with lots of corners. 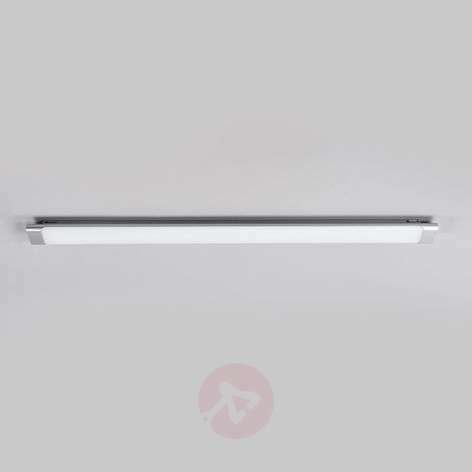 The individual heads can be rotated to the precise position required to direct the light. They are available in a wide range of designs, from timelessly modern to industrial to Scandi. LED panels are extremely popular, as they come with numerous benefits and a range of practical features. These include dimming, colour change and adjustable luminous colours. A service life of up to 50,000 hours – maintenance-free! And the best thing: you get to choose between ceiling lights with built-in LED lighting technology and lights with a standard socket and, thus, light bulbs that can be removed and replaced. You can simply screw in the LED light bulbs and enjoy all of the benefits. Yes, you are spoilt for choice! Also, the modern LED technology makes it super easy to save money and to benefit from cool features like EasyDim or colour change and makes it possible to create modern, strikingly stylish designs without any frills and flourishes, as well as hugely extravagant models. As such, you can choose a ceiling light for your kitchen that has the perfect modern design to suit you and your kitchen. Yes, but not all of them. You need to clarify a few things about your new lights before you can enjoy this practical feature. 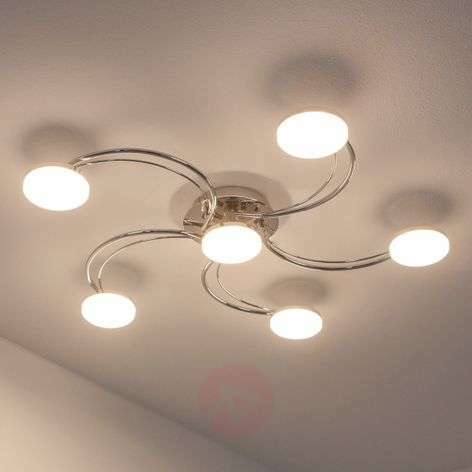 Firstly, think about what type of ceiling light you want. Simply check the product details. If there is a “Yes” next to “Dimmable”, then you just need a suitable external dimmer. Looking for even greater practicality? In addition to “Dimmable – Yes”, check in the product details for “Included” in the “Dimmer” line. Then, all you need to do is install the light and you can dim away to your heart’s content. Our tip: You don’t want to think about choosing the right dimmer? 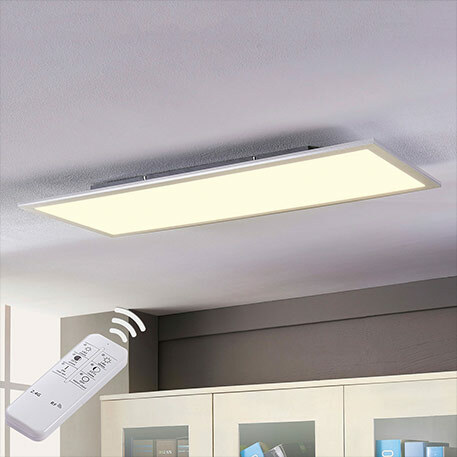 Simply opt for LED ceiling lights featuring the EasyDim function, with a remote control or – even more practical – one that can be controlled using your smartphone. Everything sorted? Or do you have a question about dimming? Perhaps how you find the right external dimmer? Not a problem! Our expert colleagues are always pleased to hear from you. Whether you ring them up or send them a message. You can find the contact details below. Of course! And they are also hugely popular at the moment. But what has made this type of light possible in the first place? You have three guesses. Modern LED lighting technology, of course! But why would I want one of these flat lights on my kitchen ceiling, I hear you ask. Legitimate question. 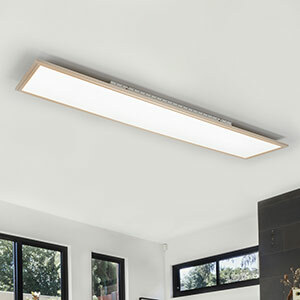 So-called LED panels save a great deal of space, even when they are on the kitchen ceiling. They can make small rooms with low ceilings look a lot bigger. The design of the lights is generally very modern and thus looks neat and tidy. They adds structure to the room and look great as part of a minimalist interior. Any other benefits? Yes, definitely! The built-in LEDs illuminate the entire surface of the lampshade evenly. This means no visible light spots and no “dark areas”. Everything sorted? Or do you have a few questions you would like to ask our experts? No problem! Simply ring +353 1 699 2138 or send us a message via the contact form. Your questions will soon be transformed into answers and your dark, dingy kitchen into a brightly lit one.